Don’t judge something’s power by its size, especially when it comes to nuts. They are loaded with protein, vitamins, and minerals and heart-healthy fats. Still, like all things, have them in moderation. Nuts are dense in calories and fat, so although a handful can be a healthy snack, have more and more and you negate the health benefits. Having said that, nuts are, in fact, great for heart health when eaten reasonably. It is safe to declare nuts as being good for your diet. True, they are packed with fat, however, it’s the healthy types of fat. Fiber and protein are also present in nuts in moderate amounts. They are also supported by a number of studies as having health benefits, especially when it comes to lessening risk factors for heart illnesses and conditions. The unassuming but powerful nut is a fruit typically made up of a hard shell and a seed. Generally, a broad assortment of dried seeds are referred to as nuts, In botanical parlance, “nut” connotes that the shell will not open to liberate the seed. Why Are Nuts Considered ‘Heart-Healthy’? So exactly what do nuts have that potentially make them good for the heart? We’ve already said they are packed with protein, fiber and good fats. 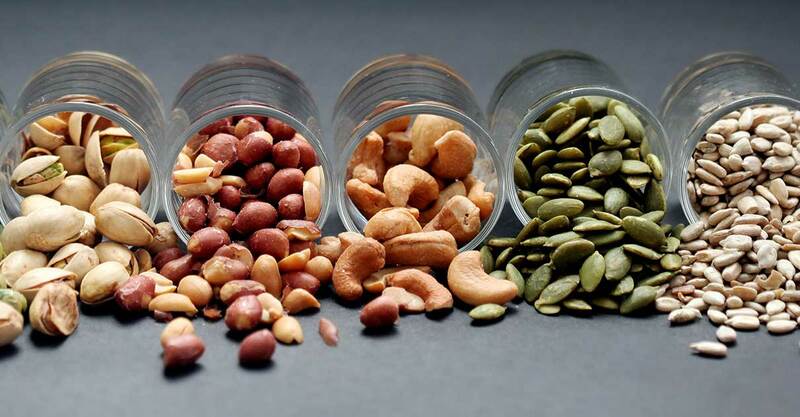 The majority of nuts have at least some of these heart-healthy elements below. A lot of nut varieties are replete with omega-3 fatty acids, which are a healthy form of fatty acids that appear to support heart health. They are said to prevent unsafe heart rhythms that trigger heart attacks. Both monounsaturated and polyunsaturated fats are said to bring down harmful cholesterol levels. Nuts of all kinds all have fiber, which aids at bringing down cholesterol. Eating fiber promotes feelings of satiation, hence one eat less. Vitamin E is believed to prevent the formation of plaques in the arteries. Plaque accumulation in the arteries can lead to angina, coronary artery disease or even a heart attack. Certain nut varieties have plant sterols, a compound that aids at lowering cholesterol. Nuts also contain l-arginine, a compound that that supports artery wall integrity by making them more supple and less likely to have blood clots that are dangerous. Pistachios are high in fiber. Just like almonds, pistachios could boost good cholesterol levels. They also help at managing hypertension, weight and oxidative status (blood levels of oxidized chemicals that can cause heart disease). This nuts could also aid at lessening the elevation in blood sugar post meals. Walnuts are a great source for omega-3 fatty acid and alpha-linolenic acid or ALA. Due to their high levels of ALA and other nutrients they are believed to mitigate a number of risk factors for heart disease. Furthermore, walnuts have been observed to lessen inflammation, which is linked to a host of chronic illnesses. Grown from trees, almonds contain many beneficial nutrients like protein, carbs, fiber, vitamin E and magnesium. They could also boost healthy cholesterol levels. Almonds have also been observed to bring down inflammation among individuals dealing with type 2 diabetes. They also support the growth of beneficial bacteria in the GI tract. This nut contains ample protein and is a decent source of minerals such as zinc and iron making it a great choice for vegetarians. Cashews are also abundant with magnesium, which is thought to aid memory. New research has revealed that pecans can decrease LDL cholesterol among individuals with normal cholesterol levels. They also contain antioxidants. Technically a legume and not a nut, peanuts are usually classified as nuts and have nutrient profiles and health benefits akin to real nuts. Research covering more than 120,000 individuals observed that elevated peanut eating was linked with lower mortality rates. Another study observed that there were lower incidences of type 2 diabetes amongst women who consumed peanut butter more than five times within a 7 day period. This nut has a broad variety of nutrients and is an excellent source of monounsaturated fat, which is good for the heart. Studies observed that diets abundant with macadamia nuts have both lower total cholesterol as well as LDL cholesterol. They could also lessen other factors linked to heart disease, such as inflammation and oxidative stress. Recent research established that a diet replete with hazelnut lessened total cholesterol, LDL cholesterol as well as triglycerides. The nut also lessened indicators for inflammation while enhancing blood vessel performance. They are likewise a good natural source for a host of nutrients, such as vitamin E.
This nut which comes from the Amazon is abundantly potent with selenium, a powerful antioxidant. The nut can likewise bring down cholesterol levels, lessen oxidative stress and enhance the performance of blood vessels among overweight teens. Brazil nuts could also lessen inflammation in individuals undergoing hemodialysis as well as healthy people. What nut you prefer or decide to eat perhaps won’t change the health benefit profoundly, as most of them have been proven to be healthy food. While some may have more heart-healthy nutrients than other varieties, the differences are practically too small make an impact. So eat the nut you like, but still with the caveat of eating in moderation. Also always be mindful that typical nut add-ons like sugar, salt or even chocolate could negate the heart-healthy benefits. Almost all nuts are ideal sources of protein and other healthy nutrients so eat sensibly and enjoy this unassumingly wonderful food.